This is a home at Air Park-Dallas, or Dallas Air Park, actually a strip of homes near an airport now owned by the City of Carrollton. You are seconds from Willow Bend Mall, in Collin County, and I mean by car. Dallas Air Park was built in 1965 by Milton Noell, former mayor of Addison, Texas, and his son David Noell. As in Noel Road. The Noells owned the airport much like the Stewarts owned Addison Airport, but it was public. They thought it would take off like a Boeing 767 but Noells’ dreams of expanding the development and building a country club out there never materialized. In 1983, Milton Noell sold a 50 percent share of airport ownership to Henry Billingsley and Lucy Crow Billingsley, daughter of Trammell Crow, and developers of One Arts Plaza, among many things. I believe they still own it. The idea behind Air Park Dallas was to allow people to park their planes at home, just like they do their SUV’s. 1620 AirPark Lane is a pretty good-sized home on two lots — 5488 square feet. 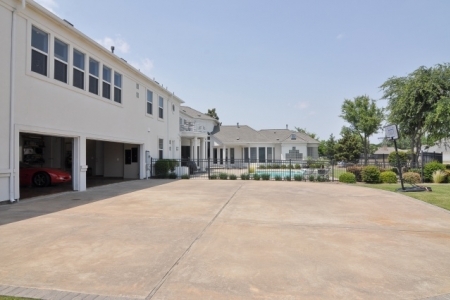 The home is your typical North Dallas/Plano soft contemporary built in 1999, one of the few newer homes, with porte cochere and dual staircases. There is a bridge to a 2323 square foot airplane hangar/”toy box” and a 1008 square foot heated and air conditioned first floor workshop with a half bath. 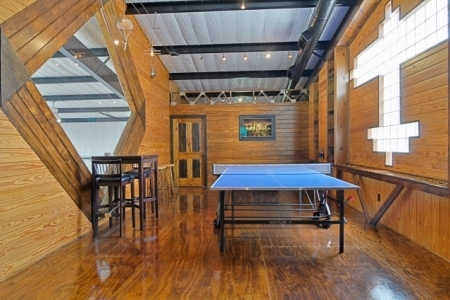 Upper mezzanine here holds a hobby, recreation room and and so much hidden storage you will forget everything that’s stored there. You get five bedrooms, four full and two half baths, four living areas, a lighted sports area with golf green, plus heated pool and spa. This place is pretty jazzed up — a slateline composite, hurricane strapped roof with cool-ply heat reflective decking for good insulation — wonder if it survived the hail storm? Strong 2 x 6 exterior wall construction, an aerobic septic system, 9 skylights, elaborate security and Elon music systems, hot water recirculation pump and soaring ceilings throughout. You wonder if they were expecting a plane to come through or something. Aesthetically, the house has hand-painted wall and ceiling finishes, designer window treatments, custom cabinetry, wood/marble/stained concrete flooring, quality hardware and lighting, Casablanca stealth ceiling fans and glass block accents. The house is kind of marbled up, a very bright white contemporary with a few too many columns if you ask me, which you don’t have to. 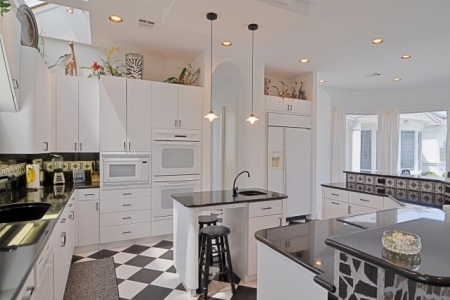 Still, the kitchen has granite counters, island with seating, custom bar and planning area. It has promise. Master suite has Venetian plaster walls, a shared fireplace with study, rope lighting (not a fan), mirrored shelves (easy to clean), and spa master bath with walk-in shower and oversized custom closet. 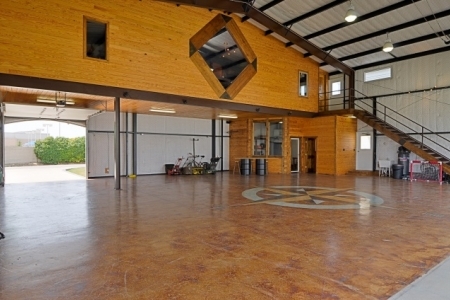 There is a study, “Bonus” room, wine room with hand-painted entrance and wood floor, game room with built-ins, and an exercise room connecting the home to the hangar. Go from treadmill to pilot’s seat in zero to ten. 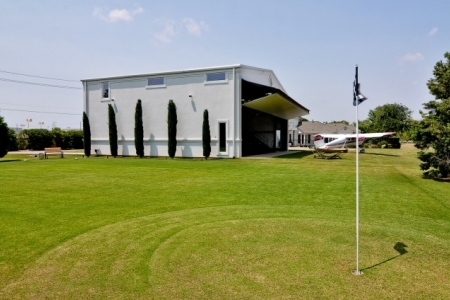 That airplane garage is a 55 x 45 steel structure, which includes a 22’ high giant swing, 52’ hi-fold brand hydro-electric bi-fold door, and high single stall garage door with opener and offers easement access to taxiways and a lighted runway. 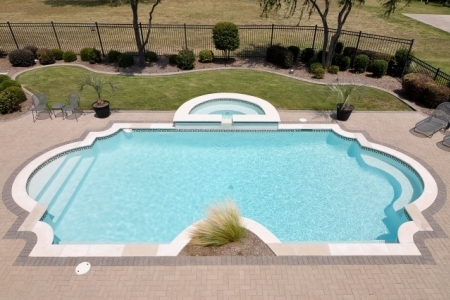 Outside, pool and spa with custom tile and coping, 529 Bermuda grass, 3 Pavestone-edged driveways, carefully-chosen trees and landscaping and view of a large grass area/greenbelt. I mean, this is really different. But if you love your plane so much you want to sleep with it, this house is for you! Asking $1,299,000.